Kristin and Wil wanted their Tampa wedding to reflect their unique story and personalities while also embracing the season and the area's rich history. Every element of their wedding was intentional and special. And much like the hidden mickeys at Disney World, this wedding had lots of little hidden personal touches filled with special meaning, including 'Player 1' and 'Player 2' toasting flutes in honor of the groom's love of vintage video games and a bumble bee bouquet brooch from the bride's late grandmother. Scroll and get ready to swoon!! The couple posed for photos at their waterfront venue, overlooking famed Bayshore Boulevard. Tampa's rich Cuban heritage and 'Cigar City' moniker, inspired details like the cigar box motif invitations and woven straw hand fans. The bride's lace ballgown was fit for a Disney princess (perfect for a fanatic bride who maintains annual passholder status at the theme parks and knows the characters from all the movies!) and her hairstyle embodied the iconic braids from the Tangled and Frozen heroines. The bridal party's silk robes featured colorful florals with both tropical and autumnal vibes. 'The Princess Bride' accessorized her gown with a gold dinosaur necklace that had actually belonged to the groom when he was a young child. The groom sported rich red details that fell in theme with this Cuban inspired affair, and even snuck in some nerdy video game references on his tie clip and cuff "Links". The couple got ready at the historic Floridan Palace hotel where they shared an intimate first look. Choosing to have a first look is a great way to get rid of pre-ceremony jitters together, and creates an opportunity for super cute photos! The groom looks suave in his grey three piece suit with red accessories, and of course shades for that Florida sun. A yellow chrysanthemum boutonniere provides a harvest touch to the groom's look for this October wedding. Bright florals in shades of orange, red, and yellow looked right at home against brick backdrops iconic to Tampa. The couple made their way to the venue on an open air trolley traveling through Downtown Tampa. And of course stopped for amazing pictures along the way! 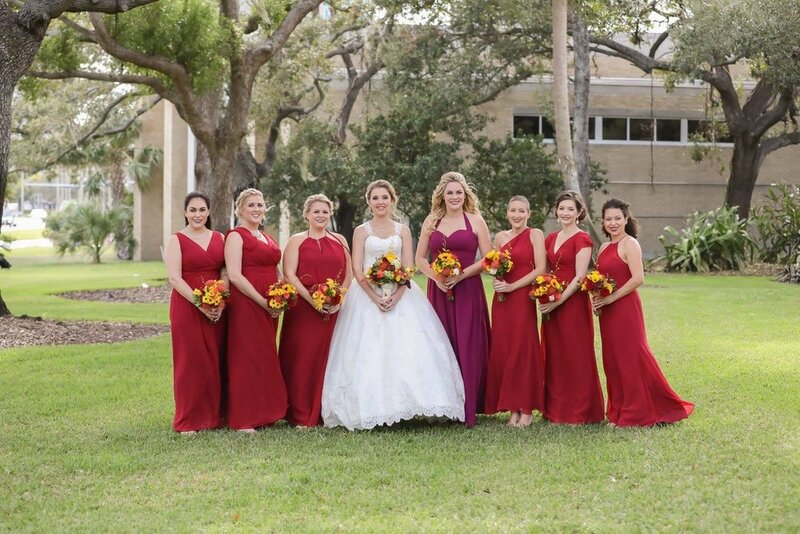 Bridesmaids wore dresses in bright fall shades which accented the colors found throughout the wedding. The bride truly looked like a princess in her lace ballgown with keyhole illusion lace detailing on the back. The Tampa Garden Club's lush garden space created the perfect ceremony backdrop as the two exchanged vows led by a close friend from the groom's residency program. It wouldn't be a 'Cigar City' wedding without a shade station complete with fedoras! Colorful flora combined Fall colors with bright hues, resulting in arrangements that reflected the season as well as surprise tropical elements. Bright florals and vintage style cigar boxes lined the aisle. The fairy tale couple share a kiss as they are received by guests, after saying "I do"! Guests enjoyed creative Florida-Cuban fusion cuisine, including passed 'Cuban cigars' of puff pastry filled with traditional Cuban sandwich ingredients studded with mustard and seasoning to resemble cigars in a cigar box. Mahogany Chiavari chairs and tropical colored linens were adorned with candle light and table numbers in gold frames, helping to marry the harvest and Havana themes! A Florida sunset created the perfect lighting to accent the ballroom. Tropical fruit was incorporated throughout the collection of cigar box centerpieces. And table numbers were presented in form of dominos (a famous Tampa pastime). The coupled shared a first dance surrounded by A LOT of family and friends! The cake featured flavor combos like Vanilla Key Lime, Hummingbird with Rum Pecan, and Guava Cream Cheese - topped off with a pair of adorable brass ducks in honor of the Peabody hotel in Memphis where the couple became engaged after the daily ducks parade through the lobby! During cocktail hour a cigar bar was presented for guests to celebrate and relax. The couple even had custom cigars made! You know the couple that plays air guitar together, stays together, right? Yeah, we totally agree! 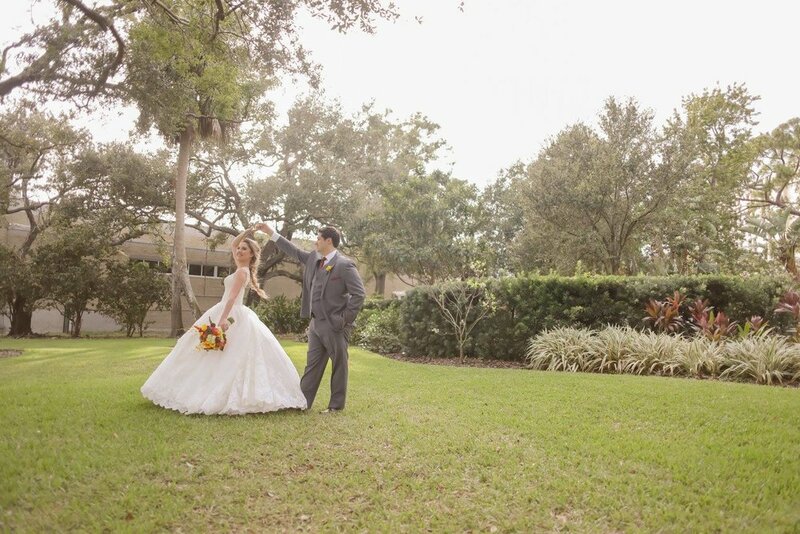 A gorgeous Florida sky was the perfect backdrop for this couple who celebrated in true Tampa fashion!